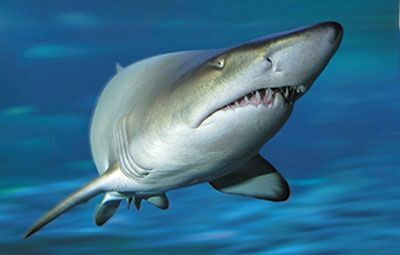 The Grey Nurse Shark (Carcharias taurus) - also known as the sand tiger shark or spotted ragged-tooth shark - is one of four species belonging to the family Odontaspididae. The species has a large, rather stout body and is grey to grey-brown dorsally, with a paler off white underbelly. Reddish or brownish spots may occur on the caudal fin and posterior half of the body, particularly in juveniles. The species has a conical snout, long awl-like teeth in both jaws (with single lateral cusplets), similarly sized first and second dorsal fin and an asymmetrical caudal fin. Grey nurse sharks grow to 360cm total length. The grey nurse shark is a slow but strong swimmer and is generally more active at night. Grey nurse sharks are often observed just above the sea bed in or near deep sandy-bottomed gutters or rocky caves, in the vicinity of inshore rocky reefs and islands. The diet of the adult grey nurse shark consists of a wide range of fish, other sharks, squids, crabs and lobsters. Grey nurse sharks have a broad inshore distribution, primarily in subtropical to cool temperate waters around the main continental landmasses. 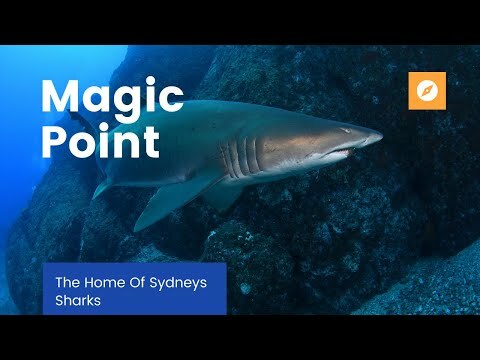 In Australia, grey nurse sharks have been regularly reported from Mooloolaba in southern Queensland, around most of the southern half of the continent (excluding the Great Australian Bight), and northward to Shark Bay in Western Australia. The grey nurse shark has been recorded as far north as Cairns in the east, the North West Shelf in the west and also in the Arafura Sea. Until recently, the grey nurse shark had an undeserved reputation in Australia as a man-eater. Harding (1990) found that it is not a threat to divers or swimmers unless provoked. Many shark attacks in Australia have been attributed incorrectly to the grey nurse shark (Whitley, 1983) often due to its fierce appearance. The grey nurse shark's reputation led to indiscriminate killing of the species by spear and line fishers. Current threats to the species are believed to be incidental catch in other shark fisheries, recreational fishing and to a much lesser extent beach meshing.